This is another delicious meal from the diet doctor site. Be sure not to get your oil to hot or put a little bit of water in with the chicken to keep the oil from burning and running the oil. Mix olive oil, garlic powder, hot sauce and salt in a large bowl. Add chicken thighs and stir to cover; alternatively, brush the mixture all over the thighs. Place the chicken in a greased baking dish with the skin side up. Bake in the oven for about 40 minutes or until the chicken is thoroughly cooked. If you use a thermometer it should read 180°F (82°C) when ready. In a small bowl, mix mayonnaise, paprika powder and hot sauce or tabasco. Set aside. Shred the cabbage finely with a knife or food processor. Melt butter in a skillet and fry shredded cabbage over medium heat until soft and golden brown around the edges. Salt and pepper to taste. 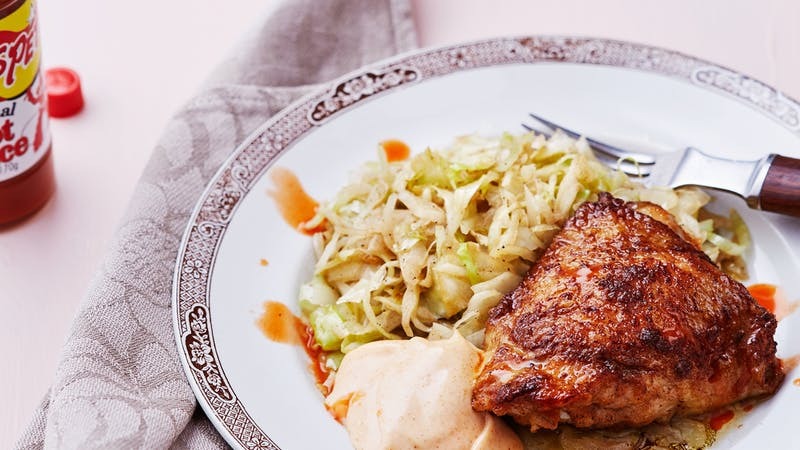 Serve the chicken and cabbage with a dollop of flavored mayonnaise and perhaps an extra dash of hot sauce.